Like all US states—and indeed, virtually political units—California is divided into a number of informal and special-purpose regions. 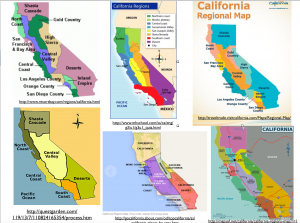 Regional designations in California are used ubiquitously in the media, in academic reports, and in everyday conversation. They are unavoidable and necessary. 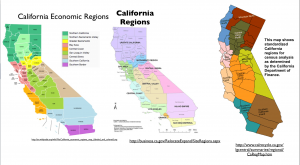 But as is generally the case with regionalization schemes, the numbers, names, and spatial outlines of California’s regions vary widely from map to map and author to author. As a result, a certain degree of confusion ensues. 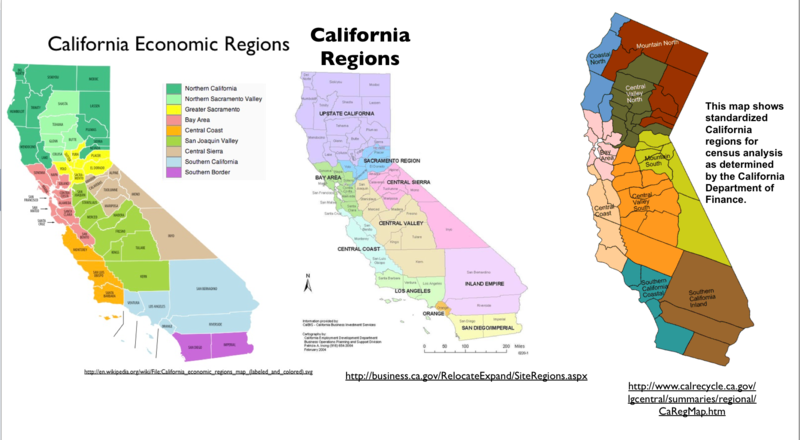 After scanning the internet for depictions of California’s regions, I assembled a number of maps and have posted them here. The first image shows six informal regionalization schemes, used mainly for tourism marketing or elementary education. As can be seen, the designation and delimitation of regions varies considerably. All but one of these maps, for example, specify a “North Coast” region, but the bottom-left map extends the North Coast southward to include the San Francisco Bay Area, a maneuver that almost no one in the Bay Area would ever make. The top-middle map, in contrast, places the Bay Area in the Central Coast region, but again this is not something that a native resident would do, as the Bay Area is habitually conceptualized as a region in its own right. Some of these maps also get the basic geography of California wrong. Both the upper and lower maps on the left side of the set, for example, severely misplace the Central Valley. 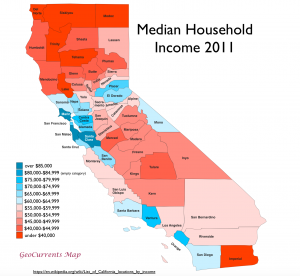 The upper-left map also misrepresents the spatial outlines of Los Angeles and San Diego counties. 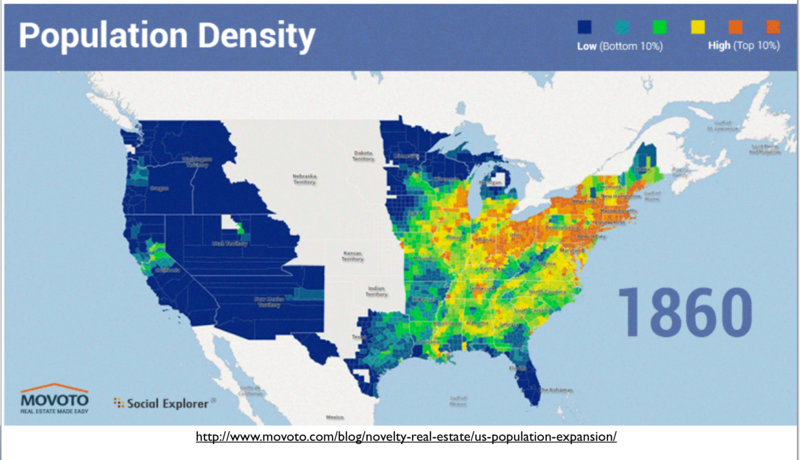 Of these six maps, the most idiosyncratic and least useful is the one in the middle of the bottom row. A vast swath of the state is labeled here as “central corridor,” as if its only significance is that of a transportation route between the Bay Area and Southern California. Unfortunately, such a geographically bigoted viewpoint is far from uncommon in the wealthy coastal districts of the state. 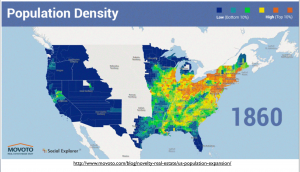 The three maps in the next set are based on counties and are designated in a more formal manner. As can be seen, the regions marked on these maps also vary to a considerable extent. Some of the regional labels found here are curious. I have, for example, never encountered the term “Upstate California,” and thus imagine that the author is a displaced and confused New Yorker. The same map also uses the designation “Inland Empire” in an inappropriate manner, extending it all the way to the Nevada and Arizona borders. As several of the maps in the previous set specify, “Inland Empire” is used in common parlance to refer only to the western slice of Riverside County and the southwestern corner of San Bernardino County, areas that are situated within the greater metropolitan area of Southern California. I must also admit to a distaste for the term “Inland Empire,” as there is nothing “imperial” about this region, and the same term is used to designate a region in eastern Washington and northern Idaho. 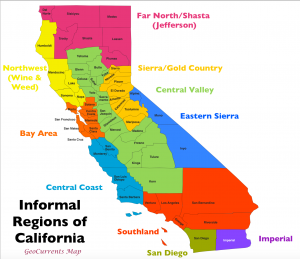 With these issues and problems in mind, I decided to create my own informal but county-based regionalization scheme, using the GeoCurrents customizable map of California. 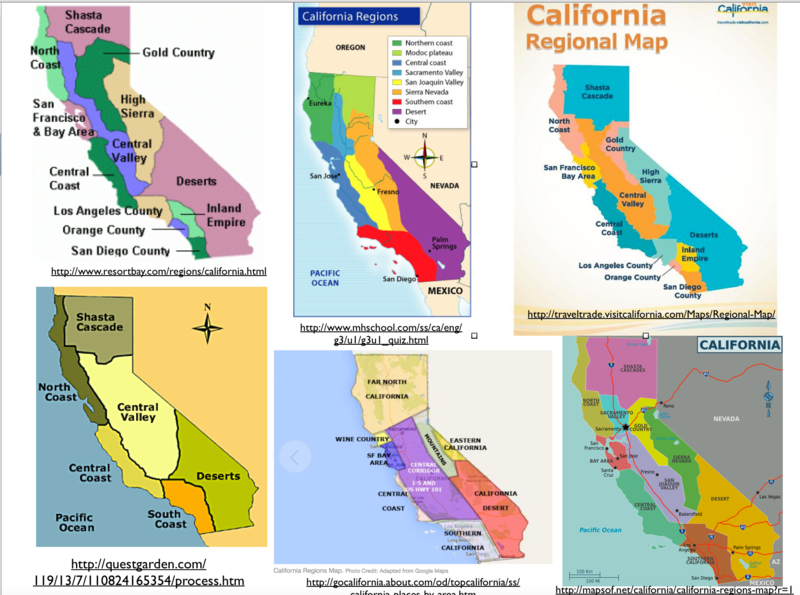 To be sure, my map has plenty of its own problems, the most important of which is the fact that many California counties span commonly conceptualized regional boundaries. But I do hope that that the regions designated here are somewhat more consistently conceptualized than those found in competing schemes. Let us begin with the northwest coastal area. Unlike competing systems, mine separates Del Norte in the far northwest from the counties located to its south. 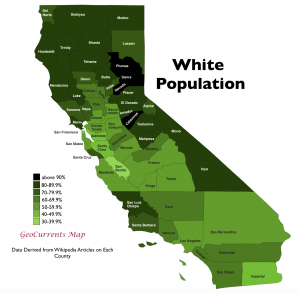 It does so primarily because Del Norte is much more politically conservative than Humboldt or Mendocino, in part because it lacks the countercultural element that is prevalent in the latter two counties. In the region that I have designated “Northwest/Wine & Weed,” tourism is vitally important and local economies depend heavily on what might be called boutique agriculture, especially that focused on the two products tagged by the label. 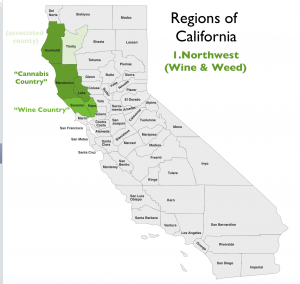 This region can in turn be subdivided partly on the same basis: more wine in the south, and more marijuana in the north, although Mendocino County scores high on both products. This region’s southern counties, Sonoma and Napa, are also more affluent and densely populated than those of the north, and are much more closely connected to the San Francisco Bay Area. Note also that Trinity County, which I have excluded from the region, could easily be placed within it, due especially to the fact that it is conventionally classified within the “Emerald Triangle” of extensive cannabis cultivation. 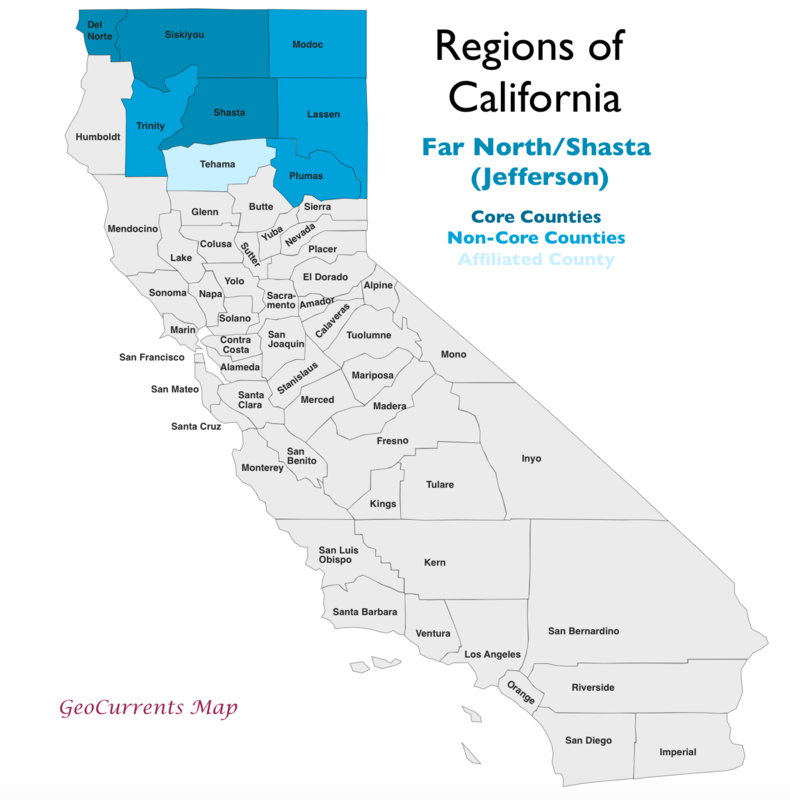 In subdividing the Far North region, I have excluded Modoc and Lassen from the core counties. This move is due to the fact that Modoc and Lassen are much more conservative than their neighbors and stand out on many other indicators as well; in terms of both physical and human geography, they fit much better with northern Nevada than with the rest of California. Non-core Trinity County, on the other hand, is less conservative and has a stronger counter-cultural element, while Plumas has much in common with the Sierra counties to the south. 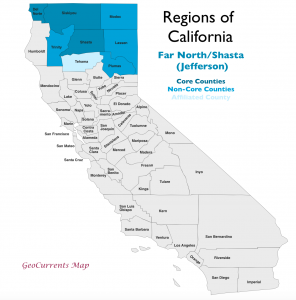 Tehama County, on the other hand, has been placed within the Central Valley region, but it has much in common with the Far North region as well. 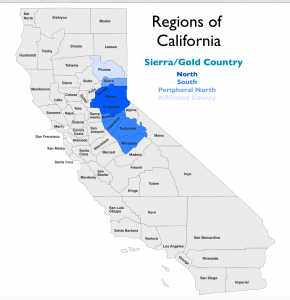 The Sierra/Gold Country region is distinguished in part on historical grounds. Owing to the Gold Rush of 1949, this was the first part of the state to be settled by English-speaking people in large numbers (along with San Francisco and Sacramento). 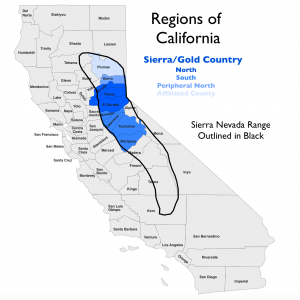 The counties of this region extend from the edge of the Central Valley through the gradual western slope of the Sierra Nevada range. (Placer County, however, also includes a small portion of the agricultural Central Valley). Historically, population in this region was concentrated in a rather narrow north-south belt in the foothills, an area called the “Mother Load” after its rich, gold-bearing rocks. Population plummeted after the gold deposits were exhausted, and the local economies switched to ranching and logging. Later, tourism surged in importance, and Nevada County in particular gained a counter-cultural element similar to that of Mendocino and Humboldt counties. 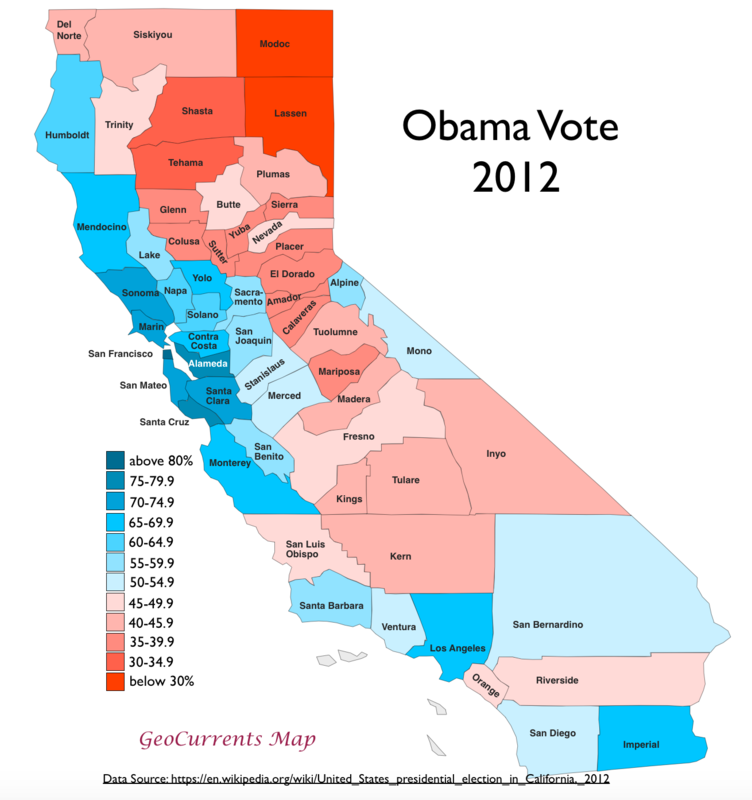 The Sierra/Gold Country region is currently characterized by fairly strong support for Republican political candidates (less so, however, in Nevada County), medium levels of income, moderately low population densities, heavily White populations, and low levels of violent crime. Placer and El Dorado counties are distinguished from the rest of the region by their inclusion of some of the suburbs of Sacramento and they share as well the Lake Tahoe basin, noted for its winter sports and other recreational opportunities. As can be seen on the income map posted here, they are markedly more affluent than the rest of the region. Sierra County in the north is differentiated by its tiny population and the fact that it does not encompass any portion of the distinctive foothill belt. 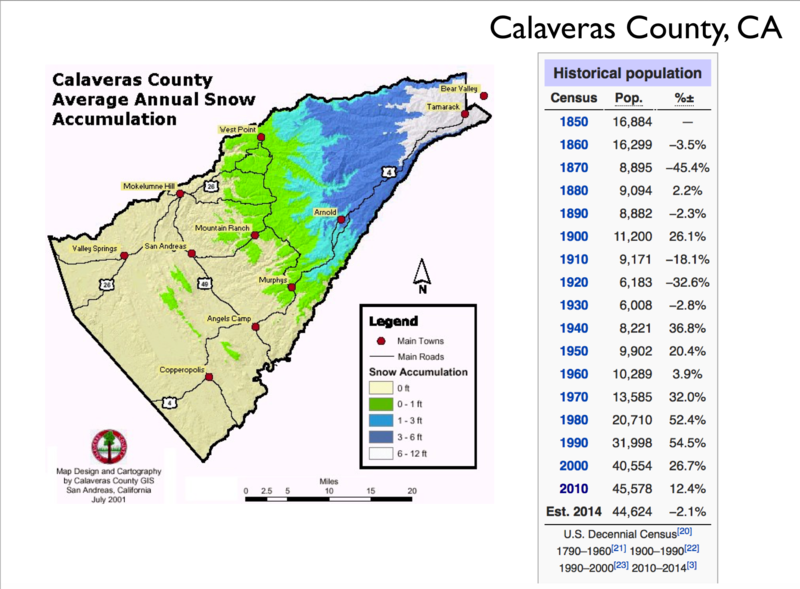 Large parts of the Sierra Nevada range are also found in several other counties, but these counties are demographically and economically anchored in the Central Valley and are thus placed within that region. In the far south (Fresno, Tulare, and Kings counties), moreover, the distinctive foothill zone is quite narrow and never supported gold-mining communities. 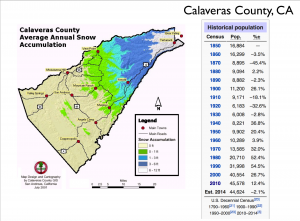 In working on this current series of posts, I was quite surprised to discover that Calaveras has one of the lowest rates of violent crime in the state, as the county has its share to meth labs as well as unsavory characters and questionable areas. It was also the site of one of the most grisly episodes of serial murder in California history. But evidently the county as a whole is a fairly wholesome place.